When we stored water that too we did in style. Style is incorrect. Splendour or magnificence is the right word for it. We stored water in stepwells. 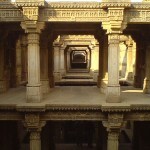 Stepwells (bawdi or baoli or vav) are in essence wells in which the water can be reached by descending a set of steps. Stepwells are most certainly one of India’s most unique, but little-known, contributions to architecture. 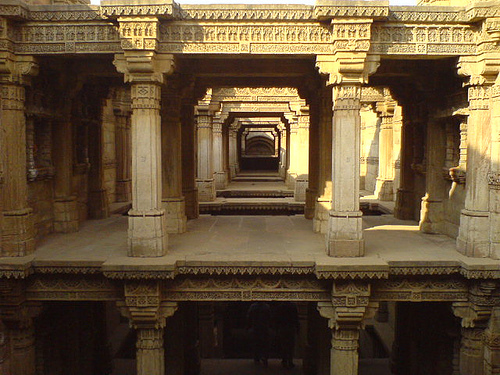 Stepwells were most common in western India, especially in Gujarat and Rajasthan. 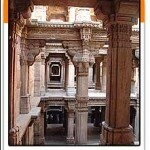 Stepwells were built deep into the earth about 5 to6 storeys in height. These wells were designed to bring people & god and water & life together. These wells meant to entice everyone to leave their abode for a cool drink of water and retreat.These were for dependable, year-round groundwater. 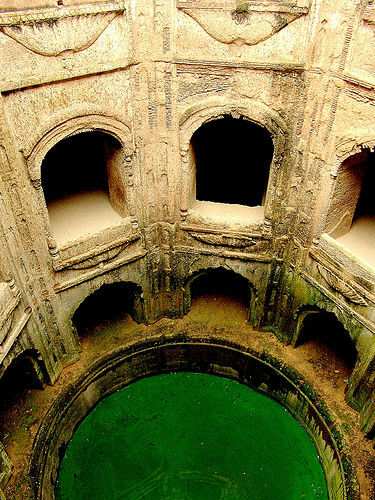 The vavs or baolis (stepwells) consisted of two parts, a vertical shaft from which water was drawn and the surrounding it were the inclined subterranean passageways, chambers and steps, which provided access to the well. 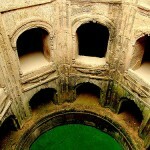 The galleries and chambers surrounding these wells were carved generously, which became cool retreats during summers. Walls of stepwells were lined with blocks of stone, without mortar, and created stairs leading up to the water. 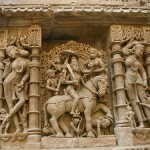 While appreciating the carvings let us not forget the science and engineering skills behind these. 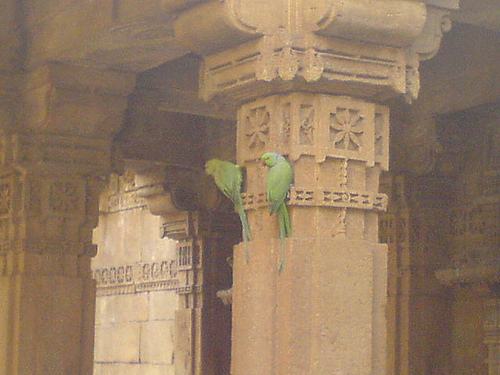 So many pillars and lintels are made to support the five or seven storeys and that too everything under the surface of the earth. Stepwells have also withstood the earthquakes in the range of 7.6 on the Richter scale – the large flat stones joined superbly are hard to move. These were rainwater harvesting methods of that period. Stepwells may be covered or open. (Open wells are mostly called tanks). 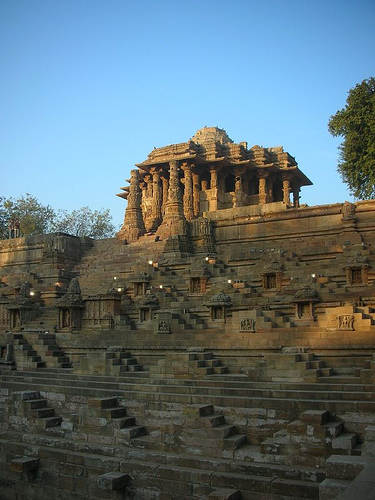 Stepwells may be a separate construction or part of a temple ( As In Modhera, Gujarat). Bundi in Rajasthan came to be known as ‘city of stepwells’. 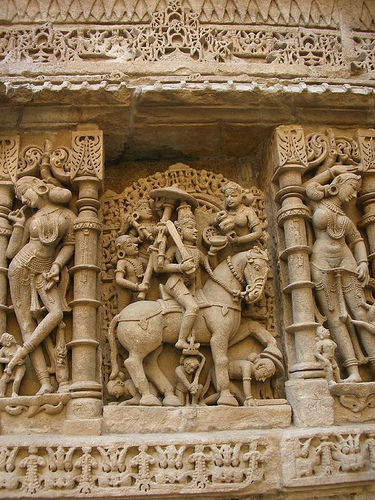 The most extravagant of stepwells is the Rani ki Vav, at Patan in Gujarat. The construction cost of Adalaj vav was 5 lakh tankas (silver coins). This vav is open octagonal surrounded by galleries on four levels with circular well at the bottom.It is the finest example of the Muslim period. Several thousands stepwells were built in western India. Numbers of surviving hydraulic monuments (stepwells) can be found in Gujarat, Rajasthan, Delhi, Madhya Pradesh, and Maharashtra. 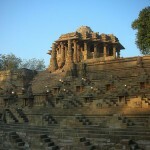 (designflute ps: More then 20 days back I decided to do a post on temple architecture of India. But I could not do it till now. The reason is very simple. The subject matter was so vast. I lost my way as to start from where. But my post ‘fruits on my dining table’ solved the problem as the designer Vibhor Sogani has designed a stepwell candle holder. I was immediately reminded of stepwells of Junagarh (navghan vav & adi-kadi vav) and the goosebums! Keep up the good work! You realize, many people are looking around for this information, you could aid them greatly. Awesome set of Information. 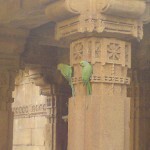 I am a stepwell freak too… been to many got pictures. 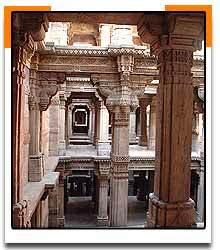 Someone tells me there is stepwell in DHABOI of Gujarat which has very less publicity ? I shall be thankful if you can let me know ? Wonderful things they built from 1 million years bc.